Casper, the friendly ghost is easily Harvey's most famous character. In fact, though many people don't like Casper as a character, his image is second only to Mickey Mouse as far as worldwide recognizability. Created by Joe Oriolo and Sy Reit in 1945, Casper first appeared in the Paramount/Famous Studios animated cartoon, "The Friendly Ghost". He went through a series of 55 theatrical cartoons and was the studio's biggest animated star after Popeye. Paramount, knowing that they had a viable licensing property, soon scouted out comic book publishers and toy manufacturers to quickly cash-in with products prominently featuring Casper's image. Contrary to popular belief, the first comic book company to publish "Casper" was St. John Publishing, which already had achieved success by publishing comic books featuring the Terrytoon characters like Mighty Mouse and Heckle & Jeckle. The first issue debuted in September 1949, but was not a tremendous success due to the monotonous and repetitive animated series the comic book was based on. The comic quietly folded after five issues. Harvey Comics, anxious to break into the children's funny comic book field like Dell and St. John, eagerly picked up the option on all of Paramount's characters, except Popeye, which was already being published by Dell. Reports that Casper was ever published by Jubilee are erroneous, as Harvey became Casper's second and final publisher until the recent issues published by Marvel Comics. Harvey also based their comics on the Casper animated series, but after 20 or so issues, realized how limited this was. 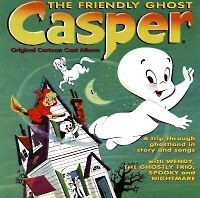 They began to expand Casper's personality, his environment and the characters he interacted with. These theatrical cartoons were first televised on "Matty's Funday Funnies" in 1959. So popular were these new characters, that they were soon added to the Casper animated films and by the time Casper appeared on TV, Nightmare, Wendy, Spooky and The Ghostly Trio were cast regulars on "The New Casper Cartoon Show". Shortly before this, Harvey acquired the complete rights to all of Paramount's cartoons, sans Popeye. Coincidently at this time, they cancelled "Casper, the Friendly Ghost" with issue 70 and replaced it with "The Friendly Ghost, Casper". This abrupt title change has caused some confusion for collectors of those early issues. As Casper's popularity began to expand, so did his exposure. By the mid-70's, Casper was a "spooks"-person for Unicef, General Electric, Collegeville costumes, the Apollo 16 flight to the moon, Major League Baseball's National League, the American Dental Association, the Boy Scouts of America, Sugar Chex cereal for Ralston-Purina, and more recently, Target Stores, Pizza Hut and KFC. In 1979, Casper returned to TV in an ill-conceived animated show, "Casper and the Angels". This time Casper was paired with a hairy ghost called Harry Scary and two policewomen, in a loosely-inspired version of "Charlie's Angels". The Hanna-Barbera series ran for only a year. When Jeff Montgomery bought the Harvey company in 1989, he set out to re-establish Casper with the public. The fruits of his labors culminated in the hit 1995 feature film, "Casper", starring Christina Ricci and Bill Pullman. The film led to another new series of cartoons that were recently appearing on FOX (and now on Fox Family Channel), that are vastly superior to the H-B series, and a series of video tapes featuring the old Paramount animated shorts. 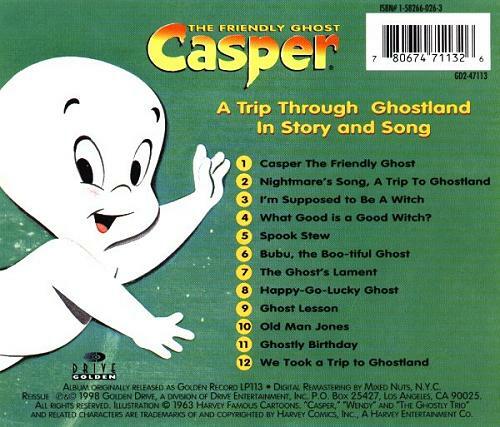 Recently, Casper was found in "Casper and Friends" magazine published by Marvel Comics and in "The Harvey Magazine"; on TV and video, and in a direct-to-video movie sequels entitled "Casper: A Spirited Beginning" and "Casper Meets Wendy". Casper appeared in "Casper's Haunted Christmas", a CGI-animated direct-to-video feature. He was back in theaters with "Casper II" in 2001. After 55 years, Casper still hasn't "given up the ghost". Click here for a "Casper" Episode Guide. Supporting features in most books featuring Spooky and Wendy. Download Noveltoon: Casper The Friendly Ghost in "There's Good Boos Tonight"
View "There's Good Boos Tonight (1948)"